Please note that the content of this book primarily consists of articles available from Wikipedia or other free sources online. 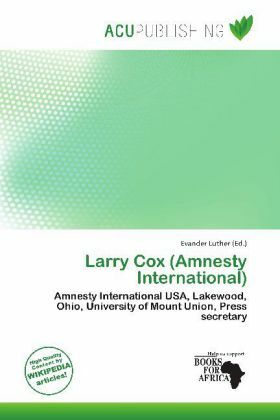 Larry Cox (born 1945) is the executive director of Amnesty International USA (AIUSA). Cox was born in Lakewood, Ohio. He graduated from Mount Union College with a B.A. in history. He first joined AIUSA in 1976 as a press officer, going on to become communications director and deputy executive director, and director of AIUSA's program campaigning against the death penalty. In 1985 he became deputy secretary general at the Amnesty International General Secretariat based in London. In 1990 he left Amnesty to become executive director of the Rainforest Foundation, a position he held until 1995 when he was appointed senior program officer at the Ford Foundation. He returned to AIUSA as executive director in 2006.